A few complaints have been made about my lack of blogging lately. Unlike some people who have become blogging fiends, I haven’t gotten uber-excited about any particular political candidate yet, partly because Michigan got itself disenfranchised out of the primaries and partly because I actually like both Obama and Clinton, so it’s pretty much a win-win in my mind. (I have a preference, but not an overly strong one.) It’s not like there was ever any doubt that I would go into November voting for someone other than the democratic candidate — I’m pretty consistent that way. Speaking of the national political scene, I went and visited Jenn in DC last weekend. 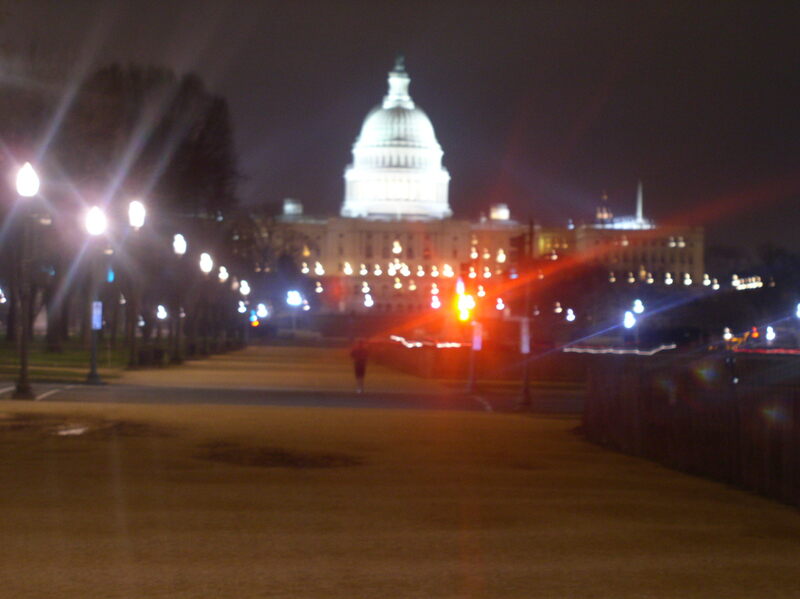 We participated in some (simulated) espionage, saw some monuments, and I failed to take a good picture of the Capitol at night. But I did get a sort of artsy shot of the Washington Monument via the Jefferson Memorial, which I kind of like. It might be better if I did some strategic cropping, but I’m too lazy.